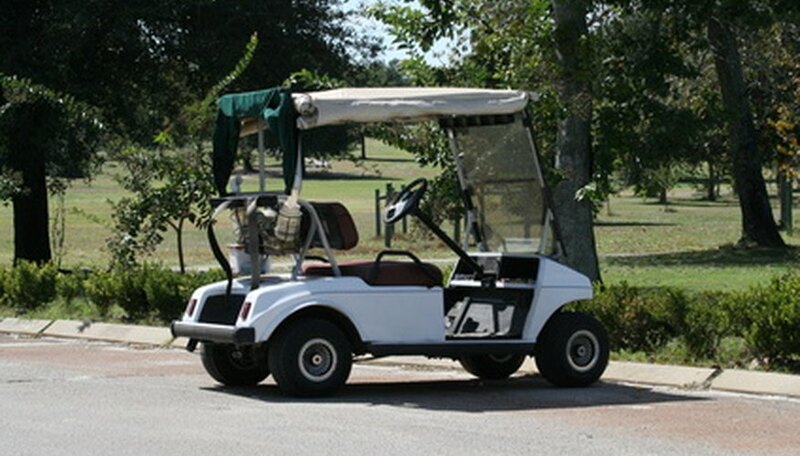 Golf carts run on an electrical system using 12-volt batteries. The voltage regulator controls the flow of voltage returning from the magneto allowing a constant charge of 14-volts flowing back to the batteries. If the voltage regulator malfunctions, it will stop the flow of current to the batteries causing the batteries to drain. It may also cause over-charging, resulting in damaging the batteries. Testing the voltage regulator takes 10 minutes to complete. Check the golf cart on a hard, level surface and set the parking brake. Place the wheel chocks in front of the front tires so the golf cart will not move forward. Place the jack under the frame at the rear of the golf cart. Raise the jack and place the jack stands under the frame behind the rear tires. Lower the jack until the golf cart is resting on the jack stands. Lift the seat up exposing the batteries. Turn on the voltmeter and set it to 20 ohms. Place the red lead from the voltmeter to the positive post of one of the batteries. Place the black lead from the voltmeter to the negative post to the same battery. Check the voltmeter reading, it should read 12-volts. This will indicate that the battery is good. Move forward with testing the voltage regulator. Depress the forward control pedal while the voltmeter is connected. Read the voltmeter. It should read between 14-volts to 16-volts. If the reading remains at 12-volts, the voltage regulator is malfunctioning.